Successfully Added 2.4 Inch 1.3 Million Pixels Quad Band Phone to your Shopping Cart. Made of high quality material, excellent strength, avoids slipperiness, stylish and cleek design. Huge battery capacity, up to 5200mAh and stands amzaingly 30days of standly and daily usage. Extremely loud speaker, allows you hear and phone call even in the noisiest environment. Super strong flash light, no more fear of darkness, every corner of the earth ready for you to explore. 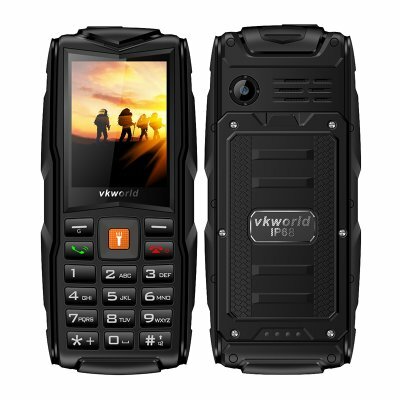 The Quad Band Phone is made from high-quality material, excellent strength, waterproof & dustproof & drop-proof and long life use, stylish and sleek design; Only work with GSM networks which frequency is 850/900/1800/1900MHz; Dual standard cards, dual standby; Large capacity memory, 64MB RAM and 64MB ROM; Design with an 8GB TF card slot to increase the memory; High capacity removable battery up to 5200mAh and stands amazingly 30 days of standby and daily usage, serves as power bank for other devices; Support USB charging; Single camera design, 1.3 million pixels rear camera can take photos and video recording, image format for BMP/GIF/JPEG/PNG; video format for 3GP/MP4; Additional features are Alarm clock, Bluetooth, calculator, calendar, MP3, flashlight; Extremely loudspeaker, allows you to hear and phone call even in the noisiest environment; Super strong flashlight, no more fear of darkness, every corner of the earth ready for you to explore. Support languages: English, Russian, French, Spanish, Italian, Turkish, German, Vietnamese, Polish, Thai, Arabic; Water-resistance design, stands about 30 minutes underwater, not afraid of any splash, feel free to use in rain/shower/water area; Dust-resistance, protects the phone from dust, sand, dirt, ash; The Quad Band Phone comes with 1 x phone, 1 x compass hook, 1 x 5200mAh battery, 1 x LED light, 1 x power adapter, 1 x USB cable, 1 x English manual.